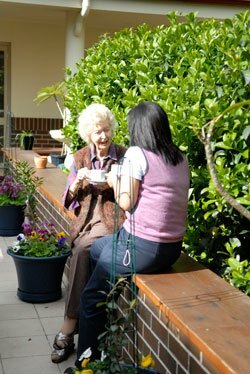 Residential respite care provides short term care in aged care nursing homes. It is generally for people who are in need of temporary care who intend to return to home. This care is used in emergency situations or to provide a “break” while carers attend to other matters or have a holiday. Residential respite is also an option for seniors who are being discharged from a hospital or who have recently been ill and need a temporary place to stay until they feel confident enough to return home. Respite care can be provided at the care level needed, depending on your requirements. It also provides the opportunity for us to get to know you and you to know us. If the need arises for full time care, then you can book into a familiar environment. You may have 63 days respite care in a financial year. There is a possibility of a further 21 day extension subject to approval from the Aged Care Assessment Team. High care is for people who require almost complete, often continuous assistance with most daily living activities. This care type includes accommodation, meals, laundry, room cleaning and personal care. Nursing staff at high care facilities also manage all medical requirements for the resident. Basic medical and pharmaceutical supplies including continence aids. In low care residents are encouraged to be independent and continue their daily activities, with support. Low care suits many people, particularly those with limited mobility, who need greater access to personal care than people living at home. Assistance is provided with meals and laundry, and personal care such as supervision of medication, dressing, bathing and room cleaning.